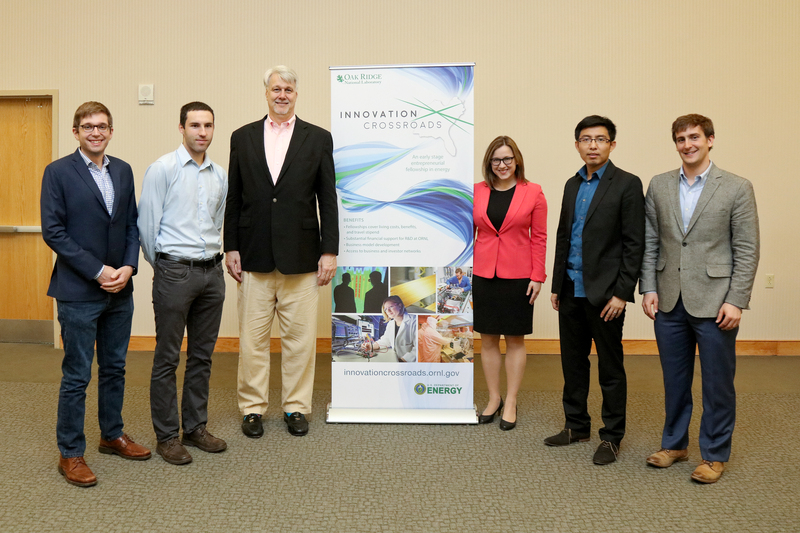 ORNL welcomed its first group of research fellows to join Innovation Crossroads, an entrepreneurial research and development program based at the lab. From left, Matthew Ellis and Samuel Shaner of Yellowstone Energy; Mark Johnson, director of DOE’s Advanced Manufacturing Office; Johanna Wolfson, Technology-to-Market director in DOE’s Office of Energy Efficiency and Renewable Energy; Ming Qi of Peroxygen Systems; and Mitchell Ishmael of Active Energy Systems. Not pictured: Anna Douglas of SkyNano Technologies. Innovation Crossroads, announced in the fall of 2016, is one of DOE’s Lab-Embedded Entrepreneurship Programs that embed top technical talent within national labs as entrepreneurial research fellows with the express goal of subsequently launching businesses. The program’s dual focus on early-stage R&D and entrepreneurial development enables the innovators, selected through an open merit-based process, to transform their breakthrough ideas into U.S.-based companies. The two-year fellowship provides a cost-of-living stipend, comprehensive business development plan assistance, and up to $350,000 to use on collaborative R&D at ORNL, the nation’s largest science and energy laboratory. Mitchell Ishmael’s novel solution for energy storage aims to utilize low-grade waste heat by storing it as thermal energy in tanks, resulting in a cheaper alternative to providing backup power than standby generators or batteries. Ishmael is a materials science and engineering doctoral candidate at Cornell University. More details can be found at www.innovationcrossroads.ornl.gov. EERE's Advanced Manufacturing Office (AMO) supports early stage applied research and development of new materials, information, and processes that improve American manufacturing’s energy efficiency, as well as platform technologies for manufacturing clean energy products. AMO works closely with EERE’s Technology-to-Market Program on lowering barriers to market exploration of competitive clean energy technologies.